Frisky, fun and frayed best describes Smell My Pillows first full length album. There’s something refreshing, something dignified to be able to laugh at yourself, in light of a congested market; to disregard a self awareness, to just be, and this four-piece from Minnesota really aren’t hot and bothered about making record deals, or attracting a huge crowd. How cool. They racket in the same vein as Cure, Zeppelin and even flirt with the eccentric nature of The Bloodhound Gang, so if their sole goal is to only make decent noise you’d think they’d be imitating the right bunch, and the popularity should follow suit. Like most of these alt-pop-rock crafts, they make or break it through the lungs of the chosen vocalist, which handled by Mike Matheson showcases a mixed performance, if bordering on the wrong side of tame. 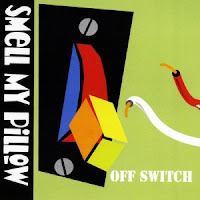 The record excels in space and downtempo, and when Smell My Pillow decide to slow it down, particularly on tracks “Kissing The Grand”, and “Katelyn”, it turns “Off Switch” into something much more punchy; more adventurous – shame then the rest of the album trails behind, in wish-washy, rocky tedium.